Do you have dozens of apps on your iPhone or iPad? Do you spend lots of time swiping back and forth between screens looking for the right icon? If so, you should instead use the built-in search function since it is much faster. If your iPhone or iPad is using iOS 7 or newer then you access the Spotlight search feature by swiping your finger down on your devices screen. However, it’s important to not start your swipe too high on the screen. I recommend that you start your swipe around the middle of the screen. (If you start your swipe too high, you’ll see the Notification Center which will likely show your calendar.) 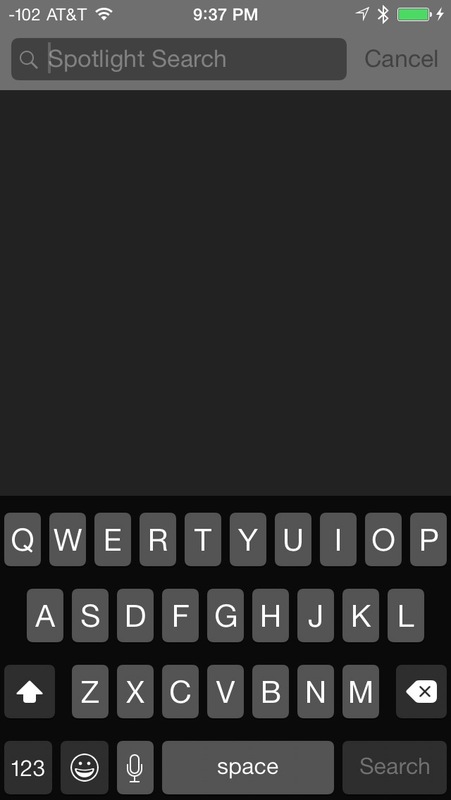 If you swipe properly you’ll see the words Spotlight Search at the top of the device, as shown to the right. 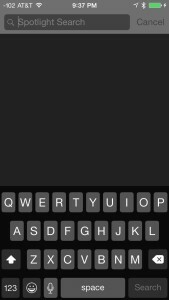 Then, use the keyboard to type the name of the app that you seek. The search results will appear; tap on the app’s name to open it. It’s that easy! I should indicate that you can also use Spotlight to find a person listed in your address book, an event on your calendar or an email message. If your iPhone or iPad using iOS 6 or earlier the instructions are slightly different. First, you have to navigate back to the first page of icons. Then swipe your finger from left to right, across the screen. If you’d like illustrated instructions, check out WikiHow’s instructions for searching on both current and older versions of iOS. On a related note, if you swipe up from the bottom of your iPhone or iPad’s screen you’ll open the Control Center. It gives you quick access to the calculator, flashlight, Airplane mode, camera, timer, stopwatch and more. To learn more read my previous Tech Tip about the iPhone’s Control Center. Read more about ios, iPad, iPhone, spotlight search, swipe down.